Let us remember with thanksgiving the life and ministry of the Reverend Rachel C. Ye Kim, who by the grace of God entered that kingdom which has no end on January 14, 2015. She was married to the Reverend Gye Ho Kim (Tom) on January 20, 1998. They are the parents of two children, Jonathan age 14 and Elizabeth age 12. Pastor Kim is appointed to New Haven: First & Summerfield. Rev. Rachel’s ministry began and ended in the New York Annual Conference. She received Deacon’s Orders and became a Probationary Member in 1989, followed by Elder’s Orders and Full Membership in 1991. 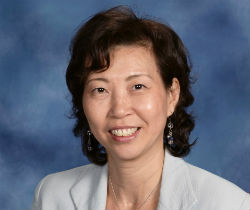 Her appointment history began at Poughkeepsie: Mid-Hudson Korean, Associate Pastor (1989-1991); Port Washington, Associate Pastor (1991-1993); Korean Church of Greater Washington, Virginia Conference (1993-1997); Hartsdale, NY: St Paul’s (1997-2005); Family Leave (2005-2006); Shady (2006-2012); New Haven: St. Andrew’s (2012-2014); Medical leave (2014). A Service of Death and Resurrection was held on January 17, 2015 at the Mary Taylor Memorial UMC, Milford, CT. The Reverends Kun Sam Cho, Bishop Jane Allen Middleton and Superintendent Kenneth Kieffer participated. Clergy of the conference were invited to vest, process and sit together. A service of committal followed the church service at King’s Highway Cemetery, Milford. Following the services all were invited to the church to greet the family and share refreshments.